If you're looking for an AFFORDABLE BENZ that's SPORTY & FUN TO DRIVE, then we have the vehicle for you. 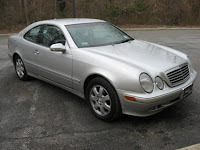 We are featuring today this 2001 Mercedes Benz CLK320, 2-Door Coupe with ONLY 54k ORIGINAL MILES! This sleek silver bullet has VERY LOW MILES and a PERFECT CARFAX HISTORY Report. You won't find another 2001 Benz, in this condition, for the GREAT PRICE OF $12,995. Pumpkin is known for having the BEST VEHICLE YOUR MONEY CAN BUY. All of our cars are hand-picked by Owner, Franck Freon and taken through a rigorous inspection process before hitting the showroom floor. This Silver bodied CLK features Power Seats with Memory, Alloy Wheels, Gray LEATHER Interior, full power options and more. CONTACT US AT (609)646-7676 or by email at [email protected]. We take pride in our relaxed, NO-PRESSURE ATMOSPHERE and want you to be 100% satisfied with the car you choose! Check out our testimonial section and see why more and more people everyday are choosing Pumpkin Cars! For more information log onto our website at http://www.pumpkincars.com/.